Every so often, as I have been reviewing curriculum and books, we receive a nearly perfect item. Such is the case with this review from New Leaf Publishing Group. 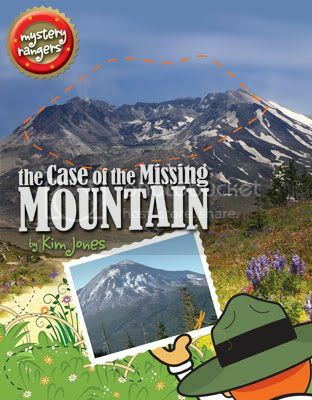 The Case of the Missing Mountain by Kim Jones fit my family to a tee, and we've been having way too much fun with this book to get around to actually reviewing it. Unfortunately, this inept photographer and videographer did not do a stellar job of recording the fun. But fun we had. This 80-page activity book for children teaches young earth creation concepts. Author Kim Jones formerly served as a guide at Mount St. Helen’s Seven Wonders Museum. She worked with many other experts to compile the facts for this title. Okay, so that gives you a clue as to what this book is like. It is part mystery, part puzzle book, part science text, part story, part experiment book. To make this book absolutely perfect for my family, there would have been a couple fewer puzzles involving deciphering codes (but the author gave me permission to solve a couple of those for my severely dyslexic and quite frustrated student!) 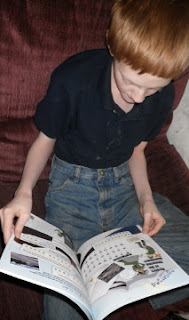 However, while he started off incredibly resistant to doing all those word puzzles, the subject matter and the mystery aspect inspired him to complete more of them than he normally would. In the picture, you can see William glaring (okay, I managed to not get the glare part) at a "figure out the code" page. You can see in the picture that the pages do have a lot of white space (I really appreciate that!) and this puzzle page does not have a lot of text. This is the first page of Mystery #4 out of a total of eight mysteries. Mystery #4 consists of ten pages, about half being puzzles, that teaches about the mudflow, the dendritic river system that formed in nine hours, and the Little Grand Canyon. My absolutely favorite activity, I'm telling you, was this one. I can't believe I'm posting a photo of our disgustingly dirty shower... but it is shiny clean now! This one was called Volano-On-the-Go, and it involved vinegar and baking soda in the bathtub (we went for the shower instead) and a sponge to clean up (quite literally) afterwords. Oh, I should have gotten a photo of my shower after William used "lava power" to attack all the scum and grime. And HE THOUGHT IT WAS GREAT. Oh, I'm telling you, this book is worth the price just for this activity. Many activities were outdoor ones. 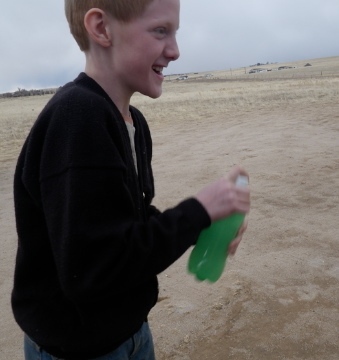 The one pictured involved shaking up a soda bottle. Obviously, William was having fun with that. 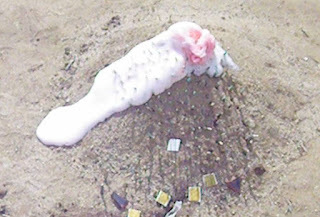 One outdoor activity we hope to do involved creating bubble art. The suggestion, though, is to do it on a day when it is not windy. Yeah. Right. We're still waiting for that to happen. There were also a couple of the later activities that involved visiting a lake, pond, or stream (we don't have any nearby... so we may not do this one at all) and one that requires leaves of different colors and shapes. That one will have to wait for later in the year when there are leaves to be found. The kids all loved this one. They started discussing what could be done to turn this into more of an experiment. 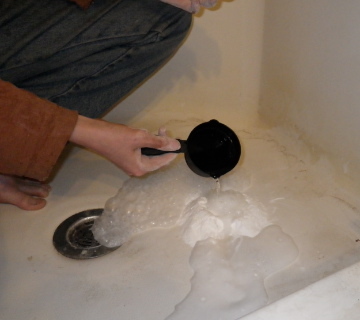 Would there be a difference with boiling water vs. warm water vs. cold water? What difference does the size of the container make? Finally, I'll leave you with my favorite photo. 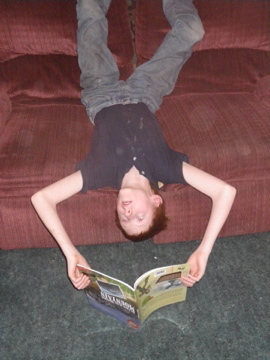 Yeah, this kid gets a little crazy with his reading sometimes. Obviously, this wasn't a part where he was having to figure out puzzles. At the end of the book, there are some other missions to be completed in order to be an Official Mystery Ranger. One involved memorizing Bible verses. We particularly liked Psalm 46:1-3. In summary, particularly for a child already interested in geology or just interested in volcanoes, this book was great. It packed a lot of great information into a fun mystery. And the activities were phenomenal. I learned a lot about volcanoes... and I thought I knew a fair amount already. This sounds like a really fun book! Our children could go through boxes and boxes and gallons of vinegar - they love making volcanos! Wow! What a phenomenal review! I love your creativity and fun spirit in the review! The pictures were great fun too! I'm really glad you enjoyed the book! Additionally you gave me some ideas for my next Mystery Rangers book! I would love to share your pics on the Mystery Ranger Fun Zone if that is OK. I can just copy them off your blog and post them near Ranger William's last pic. Thank you for taking the time to do such a delightful, fun and thorough review! (: I love it! I think we are going to do the Lava on the go experiment tomorrow. In both bathtubs and the shower. Don't know how we missed that.